The Phasianidae is composed of three traditionally separate families. 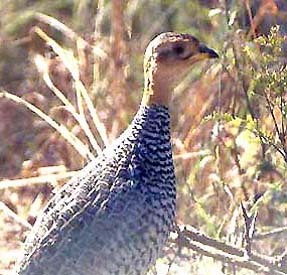 This web page summarizes the pheasants, peafowl, francolin and Old World quail — the traditional Phasianidae. 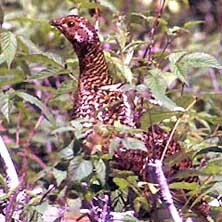 Separate pages are provided for grouse [subfamily Tetraoninae] and turkeys [subfamily Meleagridinae], largely because they had already been created. Please click on the links above to reach those pages. The Phasianidae is a large family that contains most of the gallinaceous birds of the world. It includes the ancestral chicken and the ancestral peacock. Recent molecular evidence shows that both the grouse and the turkey lineages are embedded within the larger pheasant/partridge assemblage (e.g., Dimcheff et al. 2002). Thus these groups are now included within this family (AOU 1998, Dickinson 2003). The family is now divided into four subfamilies. There are separate pages for grouse [Tetraoninae] and turkeys [Meleagridinae], leaving the remaining two subfamilies for this page: pheasants [Phasianinae] and the partridges [Perdicinae]. Among the pheasants are beautiful alpine and subalpine species like monals and tragopans, and spectacular tropical birds such as Green Peafowl (top photo above; a wild male in the dry thornscrub of eastern Java) and Palawan Peacock-Pheasant (left, in a fabulous shot by Ian Merrill), endemic and endangered on Palawan Island in the Philippines. 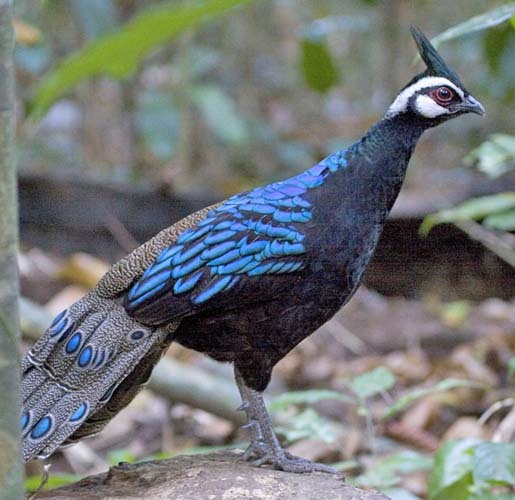 There are 49 species of pheasants and peafowl (McGowan 1994). 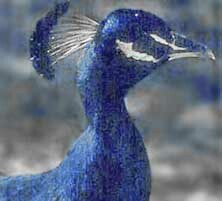 Excluding a very few "easy" species, such as Indian Peafowl, each pheasant located is a major accomplishment. Even finding a truly wild Red Junglefowl Gallus gallus (the ancestor of the domestic chicken) can be difficult; I have read that none were left in India due to hybridization with domestic fowl. Even finding a "countable" Ring-necked (Common) Pheasant (right) was a challenged for me. I "count" only native birds on my world list. Obviously, Ring-necked Pheasant is widely introduced in North America, Europe, and elsewhere, but it took a trip to China for me to be satisfied this this one (right). Because they are reclusive and live in the dark undergrowth, most species of wild pheasants are not often photographed. My wife Rita Carratello videotaped this impressive Crested Fireback (below left; a video grab) in lowland Borneo. Sujan Chatterjee photographed the spectacular male Satyr Tragopan (below right) in subalpine thickets of remote Sikkim. What gorgeous birds these are! 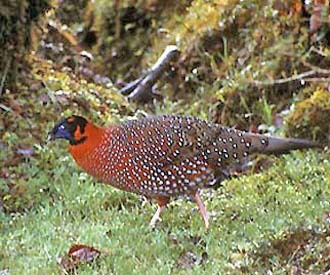 Among the super stars of the pheasant world are reclusive Himalayan denizens, including Blood Pheasant (left, in an amazing digiscoped shot by David Fisher from north China); the five species of tragopan [genus Tragopan; found locally in bamboo and rhododendron thickets, and other montane forests, from Pakistan to e. China]; and three species of monals [genus Lophophrus; one of them endemic to China and another limited to Himalayas on the China-Burma border]. Then there are 7 of the peacock-pheasants [genus Polyplectron] plus such wraiths like Golden Chrysolophus pictus or Lady Amherst's C. amherstiae pheasants. What a treat to find any of these gaudy and elusive fowl! Perhaps the most impressive worldwide birding feat of which I'm aware is the fact that Ben King has seen all 48 of Asia's pheasants; he saw his final one [Salvadori's Pheasant Lophura inornata of Sumatra] in fall 2003. Its close relative, the even rarer Crested Argus Pheinardia ocellata of Vietnam, Laos, and mainland Malaysia, has the longest feathers in the world (up to 175 cm). The partridge subfamily is even larger: some 106 species in Asia (62), Africa (41), Australasia (2) and Madagascar (1). 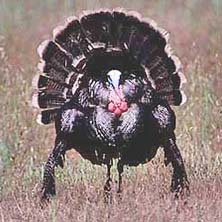 As these are prime gamebirds, hunted by avian and mammalian predators, and by man, many are shy, retiring, and elusive. 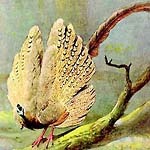 Included in the partridge subfamily are Old World quail, snowcocks, spurfowl, and francolins. Most of the latter are African species like this Yellow-necked Spurfowl (right), shown here with a half-grown chick. 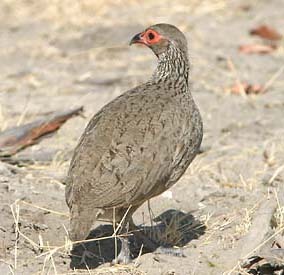 There are 41 species of francolins in the genus Francolinus; the great majority (all but five) are African species. 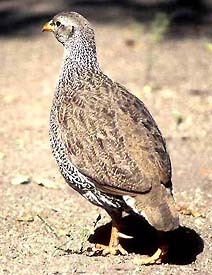 Some are very local, like the Djibouti Francolin F. ochropectus of the Goda and Mabla Mountains of Djibouti, or the Mt. Cameroon Francolin F. camerunensis, known only from that one mountain. Others, like Coqui Francolin (below left), Swainson's Francolin (below center), and Natal Francolin (below right) have much wider ranges in the thornscrub of east and southern Africa. Note the impressive spur on the Natal Francolin; spurs are carried by many species in this family. Almost all the Phasianidae show strong sexual dimorphism. 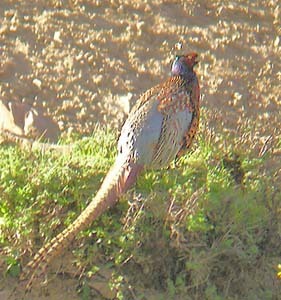 It is the gaudy male pheasants that have plumes, horns, and outlandish tails. Sexual dimorphism is also shown by francolins; note the striking difference in facial pattern in the Coqui Francolin (male below left, female pictured at top of this page). The page is my world checklist that remained blank the longest was a page of the 18 Arborophila partridge — each one very elusive in thick undergrowth. 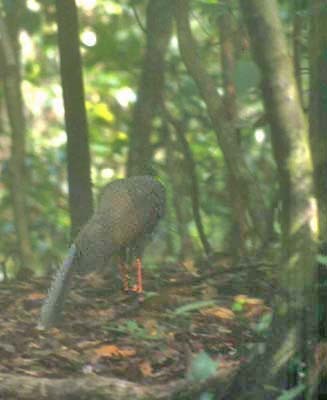 It was not until a second trip to Borneo, in 2003, that my wife Rita Carratello and I saw one of these species, and Rita managed to videotape a wild Arborophila partridge: a calling male Red-breasted Partridge (left). The latter is a Bornean endemic, found only on Mt. Kinabalu and a couple other high montane cloud forests. In additional to their retiring habits, many pheasants and Arborophila partridges are endangered or threatened with extinction due to hunting and loss of habitat, especially logging. Birdlife International (2000) lists 24 pheasants and seven Arborophila partridges in the most at-risk categories. These include three tragopans, two monals, one of the impressive eared-pheasants (Crossoptilon), and five of the peacock-pheasants (Polyplectron) of southeast Asia. Crested Argus and Green Peafowl (shown at top of page) are on this listing, as is the most "mythical" of them all, the Congo Peafowl Afropavo congensis. Almost no outsiders have seen Africa's only pheasant; until recently only native people had observed it in the wild. It is restricted to lowland forest in the heart of the Congo basin, and almost nothing is known of its biology. Because so many of the Phasianidae are prized as game or beauty, they have been widely introduced around the globe. Such introductions are unwise, yet I acknowledge how lovely some of these birds can be (e.g., the head of an Indian Peafowl, below). And it is fun to find a Chukar ( right) in California's rocky desert where the landscape parallels its native Middle Eastern habitat. A final note: the Handbook of the Birds of the World considered the grouse and turkeys to be separate families, but the evidence will not support that arrangement. They would normally be discussed here, on this family page. But because their initial pages had already been created, it is convenient to refer you to separate pages for what are now subfamilies: the grouse [Tetraoninae] and the turkeys [Meleagridinae]. Photos: The male Green Peafowl Pavo muticus was in Baluran Nat'l Park, Java, Indonesia, on 31 Aug 1988. The female Coqui Francolin Francolinus coqui was in Kruger Nat'l Park, South Africa, in July 1996; the female Spruce Grouse Dendragapus canadensis was in Jonesport, Maine, on 28 June 1980; and the Wild Turkey Meleagris gallopavo was displaying in Lake Co., California, on 17 May 1998. Ian Merrill photographed the Palawan Peacock-Pheasant Polyplectron emphanum in Feb 2006; I had just been there and seen this very male in Dec 2005 [see my Philippines trip report which features a Blake Matheson photo of this same bird]. The male Ring-necked (Common) Pheasant Phasianus colchicus was along the pass above Huzu Bei Shan, Qinhai, China, on 22 June 2004. 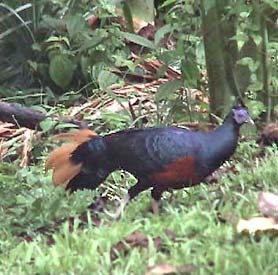 Rita Carratello took the video of the male Crested Fireback Lophura ignita at Borneo Rainforest Lodge, Danum Valley, from which this video grab was taken, in Aug 2003. Sujan Chatterjee photographed the male Satyr Tragopan Tragopan satyra at Maenam Wildlife Sanctuary in Sikkim, India, in May 1998. 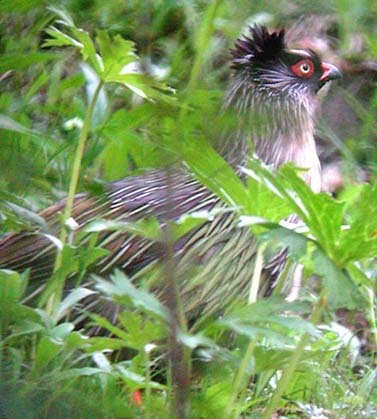 David Fisher digiscoped the Blood Pheasant Ithaginis cruentus at Huzu Bei Shan, Qinhai, China, on 23 June 2004. The poor forest-dark shot of a male Great Argus Argusianus argus was at Borneo Rainforest Lodge in Aug 2003. 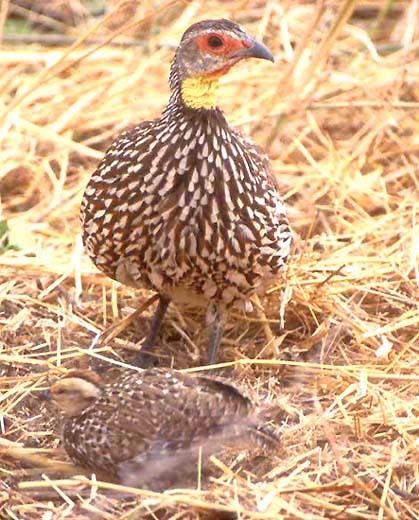 The female and sprout Yellow-necked Spurfowl Francolinus leucoscepus was in Tarangire Nat'l Park, Tanzania, in Aug 2002. 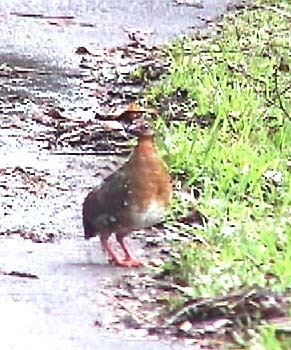 Rita Carratello took the video of the calling male Red-breasted Partridge Arborophila hyperythra on Mt. Kinabalu, from which these video captures were made, during an August 2003 trip to Sabah, Malaysia. Both the Natal Francolin Francolinus natalensis and the male Coqui Francolin F. coqui were in Kruger Nat'l Park, South Africa, in July 1996. 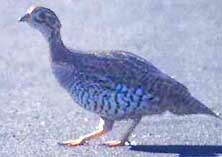 The Swainson's Francolin F. swainsonii was in Mahanga Game Reserve, Namibia, in July 2005. The Indian Peafowl Pavo cristatus was an introduced bird on Heron Island, Great Barrier Reef, Australia, in 1983. 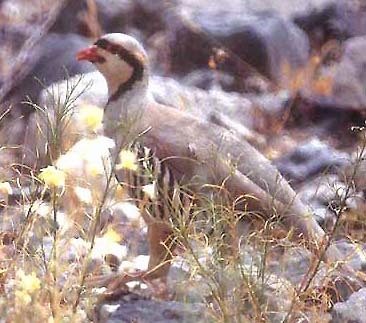 The non-native Chukar Alectoris chukar was in the Last Chance Mts. of Death Valley Nat'l Park, Inyo Co., California, in May 1986. All photos © Don Roberson, except the Palawan Peacock-Pheasant © Ian Merrill, the Satyr Tragopan © Sujan Chatterjee, the Blood Pheasant © David Fisher, and the Crested Fireback & Red-breasted Partridge video grabs © Rita Carratello; all are used with permission; all rights reserved. Bibliographic note: There are numerous coffee-table "survey" books that include pheasants and allies among "game birds." I understand that there is also a new family book in the Princeton series (Madge & McGowan 2002) that covers this family. I've not seen that effort but reviews have been mixed, suggesting it has a strong Eurasian bias (e.g., see Auk 120:920-921). This might be just fine for most of the Phasianidae! The classic family book is the now much outdated Delacour (1951). It was great fun to flip through its pages, though, in past decades. A very good introduction to the family, with a some great photos, is McGowan (1994). Birdlife International. 2000. Threatened Birds of the World. Barcelona, Lynx Edicions. Delacour, J. 1951. Pheasants of the World. Country Life, London. Dimcheff, D.E., S.V. Drovetski, and D.P. Midnell. 2002. Phylogeny of Tetraoninae and other galliform birds using mitochondrial 12s and ND2 genes. Molecular Phylogenetics & Evolution 24: 203-215. Grinnell, J., and A.H. Miller. 1944. Distribution of the Birds of California. Pac. Coast Avifauna 27. Cooper Ornith. Society. Madge, S., and P. McGowan. 2002. Pheasants, Partridges, and Grouse: A Guide to the Pheasants, Partridges, Quails, Grouse, Guineafowl, Buttonquails, and Sandgrouse of the World. Princeton Univ. Press, Princeton, N.J.
McGowan, P.J.K. 1994. Family Phasianidae (Pheasants and Partridges) in del Hoyo, J., Elliott, A., & Sargatal, J., eds. Handbook of the Birds of the World. Vol. 2. Lynx Edicions, Barcelona.